This quick English dessert with its dollops of whipped cream and sweet meringues is perfect for strawberry season. Named after England’s Eton College, where the dish is traditionally served after the annual cricket match versus Harrow School, Eton Mess is a dessert always on the cusp of being trendy. 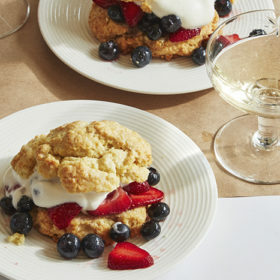 The simple dish involves layering fresh berries, whipped cream and broken pieces of meringue until your glass looks more like a fancy sundae than strawberry shortcake. This version calls for a quick maceration of the strawberries in fruity red wine, like Merlot, as you pull together the rest of the ingredients. You’ll be adding a touch of rosé and coloring to the meringue batter, which gives the finished cookie a beautiful pink hue. Pick a wine that’s made from Pinot Noir or Gamay grapes. As you pipe out the batter, don’t worry about being perfect as the cookies can all be broken up in the end. And if you’re short on time, all the ingredients can be picked up from the grocery store for quick assembly. Preheat over to 225°F and line a cookie sheet with parchment paper. Set aside. Add egg whites and cream of tartar to a clean, grease-free mixing bowl. Whisk on medium with an electric mixer until foamy, about 30 seconds. Increase speed to high and gradually add the sugar and rosé. Whisk until the batter is glossy and stiff peaks form, about 2 minutes. Add a few drops of food coloring and ½ cup of the meringue to a small bowl. Fold to incorporate the coloring. Gently fold the pink meringue into the large bowl of meringue, until color is evenly distributed. Using a large star piping tip, pipe rosettes of the meringue on the baking sheet. Alternately, make quenelles and slightly flatten them on baking sheet. Bake for 1 hour, until crisp, but not browned. Makes 36 meringues. Stem and slice 1 pint fresh strawberries. In mixing bowl, stir strawberries with 1 tablespoon sugar and ½ cup fruity red wine, stirring until sugar is dissolved. Let sit for 30 minutes, until berries have softened. Place large mixing bowl and whisk, or mixer attachments, in fridge for 20 minutes, until cool to the touch. In chilled bowl add 1 cup heavy cream, 2 tablespoons sugar and 1 teaspoon vanilla extract. Whisk on high speed until medium-stiff peaks form, about 1 minute. Do not over beat. Place a layer of whipped cream in the bottom of bowl. Top with broken meringue pieces and strawberries. Spoon strawberry sauce over the three layers. Repeat until bowl is full. Sprinkle with cocoa powder and serve.